Angler's Rest Campground Vacation Cottage for Rent by the week. $440 for seven days on beautiful French Creek. Hot and cold running water, all kitchen appliances including toaster, microwave and coffee maker. The kitchen is complete with pots, pans, dishes, silverware and cooking utensils. There is a charcoal grill on the porch but you will need to bring charcoal and starter fluid. There is a fire ring in the yard as well as picnic tables so bring your own firewood or we have firewood for sale for your convenience. 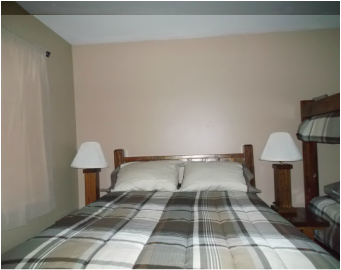 Bedrooms have one full bed in the master bedroom and a full bed and one set of bunk beds in the other bedroom. The bathroom does include a shower. There is a television, DVD/VCR player and a small radio/CD player. You will have almost everything you will need except for kitchen and bath towels and other miscellaneous paper and personal items.